For some unknown reason (but probably because we were starting to feel old), my buddy Carl and I decided in early 1999 to return to the days of our younger youth and go climb a mountain for the simple reason that it was there. Well, actually, it was on the opposite coast as we were living at the time in Wilmington, NC, and our hunk of rock of choice was none other than Washington's Mt. 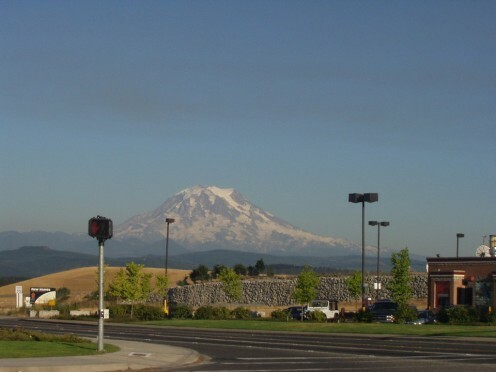 Rainier, a dormant composite volcano about 50 miles southeast of Seattle. It had probably been about five years since we had done any climbing, but we were both still in relatively good shape and figured we would have no problem conquering its roughly 14,500 feet. We talked with some of our buddies who were still big time into mountaineering including a couple who had recently climbed Rainier and decided to take one of the easier routes as we were not really out to conquer anything other than we did want to summit. But mainly we wanted to have a good time and see some of the most beautiful scenery we could find. 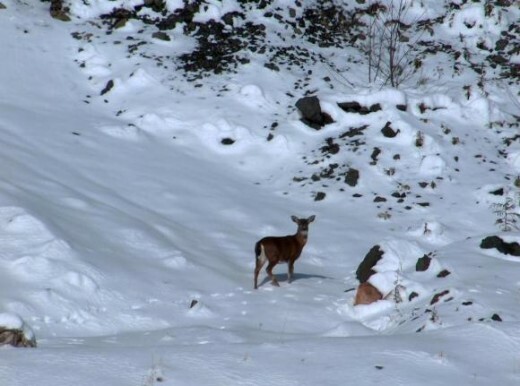 After some ribbing from our so-called friends, we chose a path of little difficulty up the southeast flank of the mountain leaving from Camp Muir like, as one of our particularly overzealous pals put it, a couple of newbies looking for a Sunday walk in the park. To remain true to this spirit, Carl and I decided to spend our first night at Rainier in the beautiful Paradise Inn rather than roughing it in the outdoors. 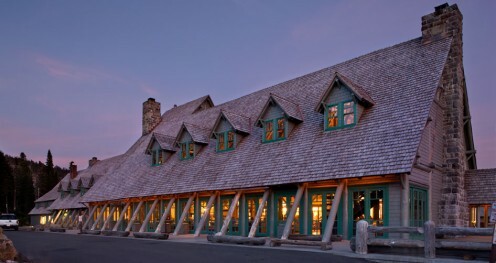 The inn was built in the early 1900's and is considered one for the great lodges of America. Though we were spending the night in relative comfort, the inn does not have television or phones so we were able to (i.e. left with no choice but to) spend the evening planning our climb and hanging out with the other lodge guests. Throughout the evening we met and chatted with other climbers and hikers and a few vacationers who had simply come for the scenery available at the inn. There were visitors from as nearby as Seattle and as far away as Australia, Japan and Thailand. There were climbers who had climbed mountains much higher than Rainier and climbers who were relative beginners. But the one thing everyone had in common was a sense of awe and unbridled excitement. The next morning we started our trek up the mountain. By now, we had begun to lose a little of our silly bravado and reckless devil may care attitude as we got a little more serious about our journey. Anyone reading this who is not familiar with climbing but might be thinking about giving it a try needs to know that, though I intend this to be a lighthearted tale of an enjoyable summer memory from my past, mountaineering requires dedicated commitment. As mentioned before, we decided to make the climb early in 1999 and spent every weekend for four months plus our first week of vacation preparing ourselves even though we had over ten years experience each before our five year absence from the sport. Somewhere in the back of our minds we knew that an average of three people per year die while on Mt. Rainier. 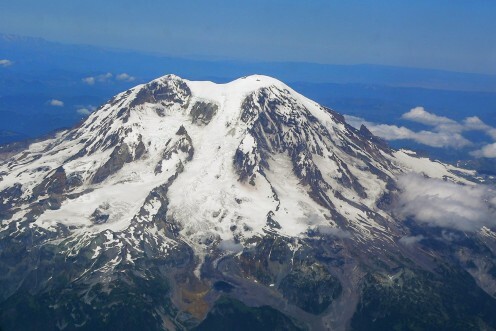 And as one of the most seismically active volcanoes in the Cascade Range, there are about 30 earthquakes per year beneath Rainier which can generate avalanches, mudslides, debris flows and any number of dangerous hazards. These are statistics it is wise to remember. As we started up the mountain we were surrounded by the beauty of the Muir snowfields that were still mostly full of snow in the early days of June. 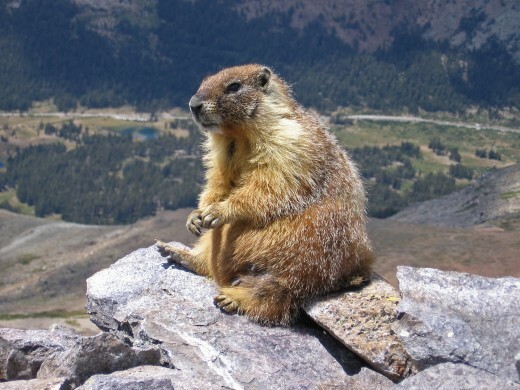 As we had chosen one of the most popular routes up the mountain, it would be hard to call our hike a wilderness jaunt, but we did manage to catch a few glimpses of elk, black-tailed deer, marmots and what seemed to be a herd of squirrels. Every step seemed to take us further away from the day-to-day shuffle of the modern world as we trekked not only up the mountain but also seemingly back in time. 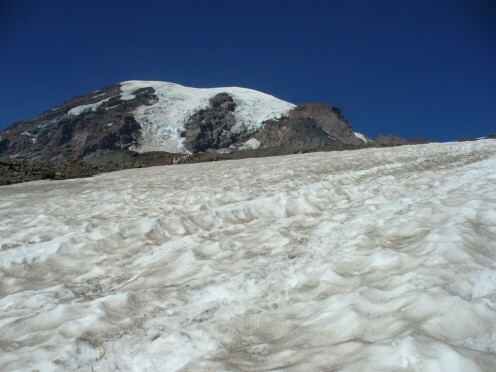 Just from the Paradise Inn to Camp Muir, which was our official starting point, it is about a five hour hike. We were in no hurry and probably took about seven hours to complete this first section of our climb. We had the rest of the week -- a full eight days -- before we had to be back in Seattle where we would catch our flight back to Wilmington. We had no intention of being in any sort of hurry. We considered making camp before moving on but our desire to take it slow was at odds with that unbridled excitement I mentioned and in the end we decided to move on. All around us nature was alive with wonder and as we climbed we marveled at the beauty around us. The sky was bluer than blue and in stark contrast to the pure white snow, crystalline ice and silver and gold flecked greyness of the stone behemoth beneath us. After a brief rest at Camp Muir, we headed further up, becoming ever more cautious but also ever more enthralled with the landscape around us. Our first true challenge was an area known as the Disappointment Cleaver. I suppose it got that name because it is the point when many climbers must face the disappointment that they may not make it to the top. Okay... that's possibly not true. I have no idea why it earned that name, but it is still true that it is a point where many turn back. But not Carl and I. Though we were both silently cursing our five years of slackness, we soldiered on with nary a complaint vocalized between the two of us. As darkness approached we made camp for the night to rest for our second day of climbing and to just enjoy the mountain itself. I could go on with detailed descriptions of each part of our climb but it is really impossible to do justice to the exhilaration of the climb or the beauty of the scenery with simple words. Suffice it to say that the air just kept getting cleaner, the land more serene, the wildlife more abundant and our vacation shorter and shorter. We could have made the summit in two days but we stretched it to three. Almost too soon, late on the morning of our third day, we found ourselves at the summit and we truly felt we were on the top of the world. I wish I could at least find some of the photos we took as they were breathtaking, but too many years of moving too often have left them buried in a box somewhere in storage. 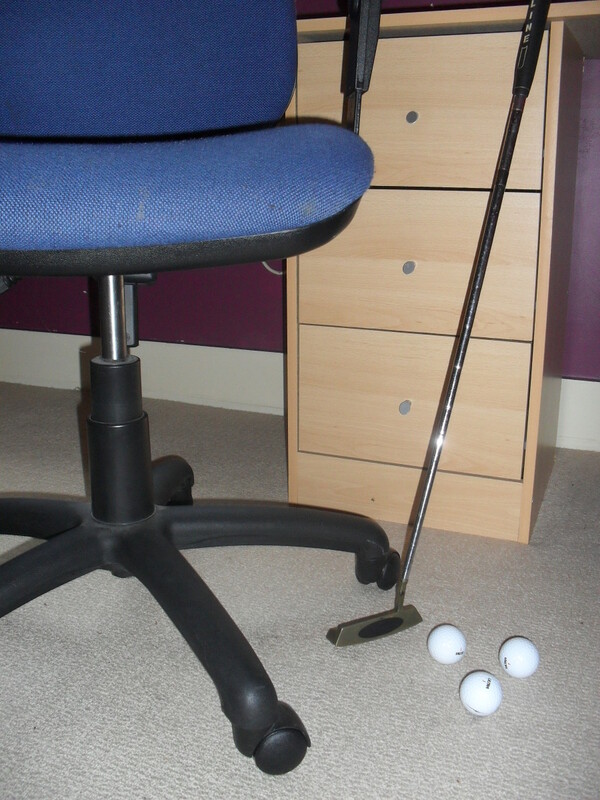 You will have to settle for the stock photos I have included... sorry! We still had five days and making it down the mountain would be no problem long before nightfall. We decided instead to make camp and spend the day and night on the summit. The day seemed to fly by as we first set up camp and then chatted with other climbers who happened along. A trio of brothers from Norway also decided to make camp at the top and they were great company with their tales of mountaineering conquests from around the world. Two of the brothers were quite experienced climbers but the youngest was only on his third "significant" climb. We had a feeling that some of these guys "insignificant" climbs may have been more impressive than anything we had done, but our fragile egos kept us from delving too deeply into that subject. Tales of the older brothers adventures in the Himalayas made the evening a joy that passed far too quickly. Sunset brought on an incredibly beautiful show as the sky along the horizon changed from clear blue to fiery red then deep purple and finally pitch black. The stars emerged somewhere in the purple void and intensified as the blackness seeped into the night sky. No matter how many mesmerizing sunsets you may have seen, nothing can compare to the spectacular scene you can experience in the clarity of 14,000 feet. Exhausted, we settled down for the night. We were up early the next morning, not wanting to miss the return of the sun and it was indeed amazing as well. We broke camp along with our new friends and headed down the mountain together. We spent the next couple of days at the Paradise Inn and took a few hikes out to explore other parts of the area. This, Carl and I stated adamantly, would not be our last mountain to climb. But now, a decade later, I must admit I did not hold true to that statement and indeed Rainier was the last mountain I conquered. But then again, there is always tomorrow. Be sure you are prepared physically. Lack of fitness is probably the biggest cause of failure in mountaineering. Be sure you are prepared psychologically. You do not necessarily have to be set on reaching the summit on each climb, but know your goal and have the determination to get there. Learn to understand weather forecasts. Bad weather can equal a very bad climb, so learn to read forecasts and understand conditions and the changes that may come to those conditions. Know where you are going and how you are going to get there. Just as important is knowing how you are going to get back to where you started. It is never a good idea to just start out blindly. It is best to always keep moving for the most part, but be sure to pace yourself as well. Always drink plenty of fluids and it is a good idea to always have something to snack on to keep a good flow of energy. Last but certainly not least... ALWAYS CARRY DUCT TAPE. Seriously. You will be surprised. What is the best reason for climbing a mountain?